Enjoy us this Easyrider Motorcycle Trip to get away from Hoi An or Da Nang on Ho Chi Minh Trail for a night at Co Tu Hill tribe’s village and discover a completely different sides of Vietnam Central with jungles, mountains, lifestyles of the hilltribes as well as other beautiful sites of Hoi An. Departing Hoi An or Da Nang by motorcycle puts a whole new perspective on the Vietnam countryside, with fresh air and beautiful sceneries filling the senses. We’ll first stop at 1000yr old Cham temples and former US and French bases from the independence wars. We then wind our way into the mountains - this is what Easyrider Trip is all about! Travel along quiet roads, enjoying breathtaking sites at every turn and plenty of chances to stop for photos. We reach Ba Hon, a beautiful village home to the Co Tu people, where we’ll spend the afternoon and evening. The culture, traditions and lifestyles of the Co Tu has remained untouched by time and is truly one of Vietnam’s most authentic hill tribes. We’ll enjoy lunch in the village and then it’s time to delve deeper into the mountainous landscape with a short trek along the Ho Chi Minh Trail to remote mountain hot springs and pristine rivers. This evening the Co Tu hosts you in their village, with accommodation provided in private traditional stilted houses and a dinner of delicious local specialties. This Hoi An/Da Nang Motorcycle Easyrider Trip is an unforgettable experience that is sure to be a highlight of your Vietnam vacation. In the morning, wake up to the sounds of the village coming to life. Enjoy breakfast and a hot cup of coffee as you watch the morning activities of the Co Tu, heading to the fields and preparing the days meals. We bid farewell to our hosts and jump back on the bikes for our return journey to Hoi An. Today’s drive crosses the historic Ho Chi Minh Trail, through lush forests and past jaw-dropping views of the central Vietnam Mountains. Just when you thought it couldn’t get any more beautiful we arrive at a waterfall tucked alongside a towering peak for a picnic lunch. 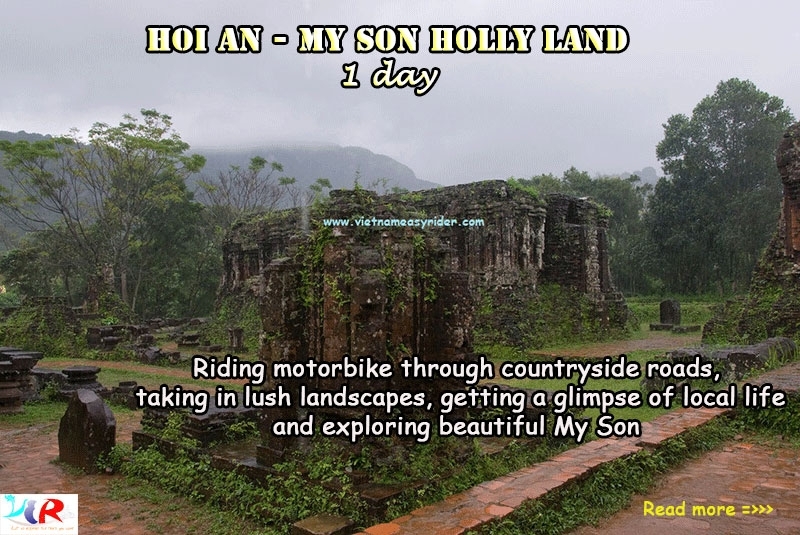 In the afternoon we will ride back down toward the coast, stopping along the way to explore old bases from the American war, crossing the Thu Bon River by local ferry and following our unique rural lane way and floating bridge road back into Hoi An/Danang.